Jesus, remember us when you come into your kingdom. Remember us, Jesus, in the Philippines. You thirsted on the cross that terrible day. We thirst. We have no clean water, and no one can reach us in our isolated village. We suffer with you, Jesus. They looted your belongings and cast lots for your garment that terrible day. Here, every source of water and food and shelter has been looted. We are not criminals. We are trying to save our children. We are naked, and wet, and cold, and hot. We suffer with you, Jesus. Remember those, Jesus, here at home, who await court trials. Their family members are terrified for them. Console all prisoners around the world who are wrongly imprisoned through the false testimony of others. You suffered that betrayal too. And as you forgave the Good Thief from the cross, let all prisoners who have sinned against you deeply know the deep consolation of your saving mercy. Your friends fled from you that terrible day. What a comfort it would have been to have them there at the cross, praying with you. Instead, your tormentors mocked you. Our elderly understand that, Jesus. They are alone in their nursing homes, forgotten by friends, abandoned by their children. Their memories fail them, and they are the source of snickering behind their backs. They suffer with you, Jesus. Remember the young people around the world, Jesus, who cannot find work. Many cannot find meaning. Many cannot find you. 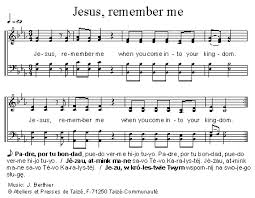 O Jesus, remember them most of all. 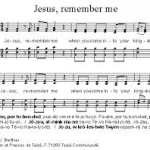 In what areas of your life do you ask Jesus to “remember” you?